They returned on the next day to take Jaxon away from his home, from his parents, and from his 10 year old sister, who he is very close to as well. He was taken to Children’s Mercy Hospital, and not allowed to see his family. The investigator had tears in her eyes when she admitted that she did not want to take Jaxon, “but they’re making me.” It came down to one statement, with no charges being filed, and CPS admitting that they had not reviewed the medical records. Dr. Hoffman had called CPS immediately after the meeting with the Adams where they asked for a second opinion. 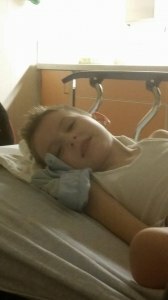 The doctor reported to CPS that Jaxon was in “imminent danger,” because his organs were at risk of shutting down because he wasn’t getting proper nutrition at home. She said that they had been building a case against them for six months, and that they had all the evidence they needed. Later, Jaxon’s parents learned that they stood accused of medical abuse, medical neglect, lack of nutrition, lack of supervision (based on him falling off the scooter when he fainted, although Tiffany was right there when it happened), and psychological abuse. The real psychological abuse took place as soon as Children’s Mercy Hospital got Jaxon under their care. His parents were allowed a brief 25-minute visit shortly after CPS took him. It would be 26 days before the system would allow this little boy to see his parents again. 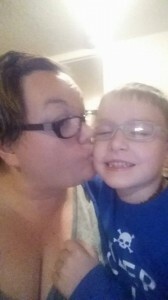 Because Jaxon tried to call his parents, the staff took the phone out of his hospital room. A couple of times, he got out of his room heading for the stairwell, in a vain attempt to escape. He later told his family that he cried a lot because he didn’t know where his family was. He felt utterly abandoned. The hospital has been feeding him foods that Jaxon is allergic to according to the parents, resulting in his being covered in eczema. The care plan called for “demedicalizing” him, taking him off of all the medications the doctors had previously prescribed, cold turkey. Interestingly, over the course of the next few weeks, they allegedly ended up re-prescribing every single prescription except the seizure medicine. They reportedly took away the wheelchair and threw away his leg braces that he used because of his hypotonia and often severe leg pain. When his parents were finally able to visit him on October 13th, after nearly an entire month, Jaxon didn’t want to let go of his mommy. The Adams say they have only been able to visit their son once since that visit. They are now permitted one two-hour visit per week. He is out of the hospital now, and in the care of foster parents. His sister has reportedly been permitted to visit him on several occasions. Because he no longer has the leg braces, there are times that Jaxon literally crawls around the house, because his legs hurt. The foster parents have allegedly been instructed to ignore any pain that he has. They say that they are forbidden to give him as much as a Tylenol for pain. Tiffany especially, as a stay-at-home mom, has gone above and beyond. There’s nothing you can do about it, and that’s probably the most difficult. My family means the world to me and I love them. You live in the United States of America, and in this particular court setting, you’re guilty until proven innocent. He was taken away with no just cause. Since Jaxon’s abduction, a couple of disturbing things have come to light. The Adams have discovered that Dr. James Anderst has been working behind the scenes watching Jaxon for several months. Dr. Anderst is the Division Director of the SCAN clinic, a division of Children’s Mercy Hospital. In one place on the hospital website, the clinic carries the description, “Safety Caring and Nurturing Clinic,” but in another place, its real purpose is revealed as the “Child Abuse and Neglect Clinic.” He reportedly told a source that, before a child becomes a part of that clinic, families that they want to watch are “funneled into” the Beacon Clinic for observation. According to the Children’s Mercy Hospital website, the SCAN clinic is also a research center for “child abuse and neglect.” Dr. Anderst is associated with the University of Missouri Kansas City School of Medicine, which receives over $47 million per year in grants to do drug research. The Beacon Clinic is allegedly often presented to the unsuspecting parents of special needs kids as a place where they can go to coordinate care and be seen quicker, with a more streamlined process. They may have no clue that as the Adams family reported, someone may be watching them. In a startling alleged comment to Health Impact News‘ source, Dr. Anderst declared that he sees about 40 cases per year, in Kansas City alone, of Munchausen syndrome by proxy, a type of child abuse where a parent seeks attention by inducing real or imagined medical symptoms in a child. Most experts maintain that the syndrome is extremely rare. Nothing in Jaxon’s story seems to read like Muchausen’s according to the parents. Yet, it appears that he is determined to make this accusation against Tiffany Adams, a mother who has simply followed the instructions of her doctors, to the best of her ability, until it became clear that another opinion was needed. By daring to contradict her son’s almighty doctor in search of answers and better medical care for her child, she is being punished in the cruelest way possible. Jaxon just wants to come home. He desperately misses his family. And they are devastated by his absence. There is a Facebook page set up to follow his case and to learn how you can help bring Jaxon home, called Bring Jaxon Adams Home. If you live in Kansas City, please contact your local media and encourage them to cover this story, on what is reportedly going on at Children’s Mercy Hospital! EDITOR’S NOTE 10/28/2014 We have seen a news report from a local Kansas City TV station stating that the doctors named in this story have received death threats. Health Impact News does NOT condone this kind of action. We strongly disagree with such actions. We have published this family’s story at the request of the parents. Their attorney encouraged them to take their story public, and we provided that platform. The doctors’ names were revealed by the family publicly on their Facebook Page. Terri LaPoint is a labor doula, childbirth and breastfeeding educator, and assistant midwife. She holds a B.S. in Cultural Anthropology/World Missions with a minor in Behavioral Science from Toccoa Falls College. She is a homeschool mom, speaker, and writer, married to the love of her life for more than 20 years. She is a passionate defender of freedom and endeavors to be a voice for the voiceless.